Beginnings is a 9-12-week small-group study that introduces the basics of Christian faith. Each session includes a meal, a video presentation, and a small-group discussion. This guide will help you, as small-group leader, facilitate the group discussion following the weekly video presentation. With background information about Beginnings, suggestions for nurturing a successful small group, and a discussion guide for each of the twelve sessions, this book will assist you in offering a transforming experience to the participants in your small group. 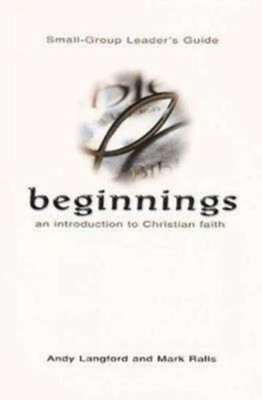 Beginnings: An Introduction to the Christian Faith introduces twelve core beliefs and practices of believers in Christ. We invite inquirers to begin an intentional journey with Jesus. By the end of this study, participants will decide to explore the Christian life more deeply. Andy Langford is a United Methodist pastor from North Carolina. Andy edited The United Methodist Book of Worship and wrote Your Ministry of Planning a Christian Funeral, and ChristianWeddings: Resources to Make Your Ceremony Unique. Andy's work blends scholarly, liturgical expertise with years of pastoral and practical suggestions for ministry. Mark Ralls is a graduate of the University of North Carolina Chapel Hill, Duke Divinity School, and Princeton Theological Seminary. He is the co-author of Beginnings: An Introduction to Christian Faith and Beginnings: The Spiritual Life. I'm the author/artist and I want to review Beginnings: An Introduction to Christian Faith (Leader's Guide).